Far from being a luxury, the notion of achieving a good work-life balance has become a key goal for professionals in the Middle East and North Africa (MENA) region. A Bayt.com survey about employee motivation in the Middle East, released in January 2013, has actually shown that 91% of working professionals in the MENA consider work-life balance a vital factor which directly affects their motivation levels at work. A good work-life balance was also identified as one of the top motivators at work in a Bayt.com poll on learning in the MENA workplace. 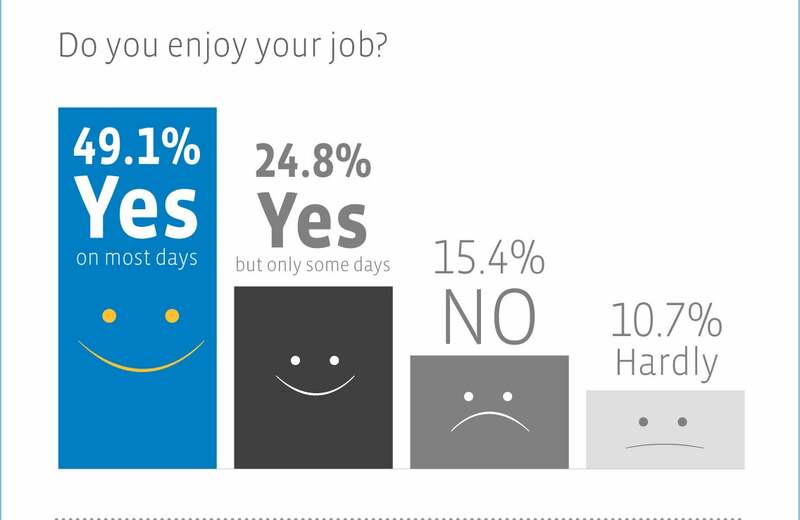 In spite of the increasing importance of achieving work-life balance for millions of professionals across the Middle East, less than one third of working respondents in the region believe that their company shows an interest in the well-being of its employees, according to Bayt.com’s survey on job satisfaction in the MENA, released in April 2015. The poll we executed on personal fulfillment in the MENA shows that the majority of MENA professionals struggle to achieve an acceptable balance between work and family life. Only 33% consider themselves fulfilled in both their personal and professional lives, while 33% say that a better work-life balance would cause them to feel more fulfilled overall. 1. Improved hiring and retention of talent Work-life initiatives give organizations a human face that allows prospective employees to distinguish one employer from another. To attract employees and hold on to them, forward-thinking companies are letting their employees know that they are just as concerned about their employees lives outside work and about helping them to manage their work and personal commitments and aspirations. Actually, being perceived as an employer of choice because of work-life balance policies can provide a competitive edge for attracting and retaining talent. Working at Bayt.com, for example, isn’t just about having a job. Every day, our employees come in to the office knowing that everything we do will change the life of others. Working for a purpose is a great positioning strategy if you want to attract top talent. Actually, five in 10 professionals in the MENA would want to work in a place where they feel their work is part of a greater purpose, as shown in the poll on employer branding. 2. Reduced stress The November 2012 poll on work satisfaction in the MENA shows that 39.3% of MENA professionals are occasionally affected by job-related stress, and as many as 34.8% are affected by job stress most of the time. 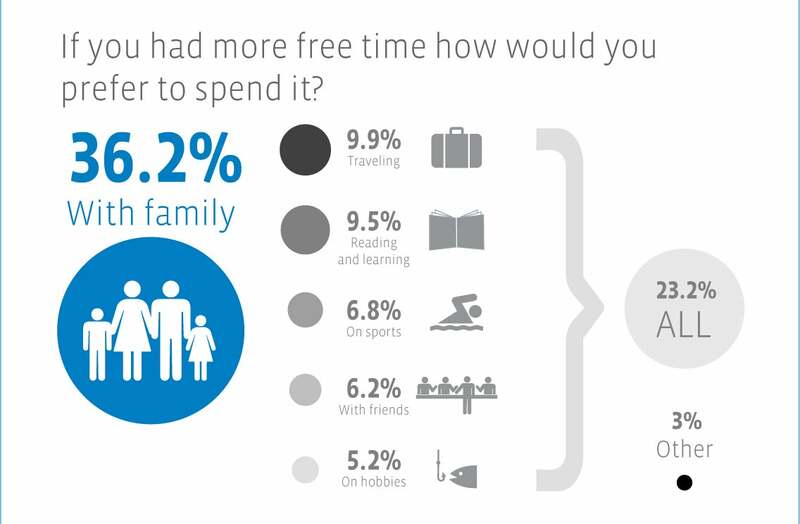 This may be correlated to the fact that 46.7% of them admit that they don’t spend enough time with their family and friends, while 57% say they don’t spend enough time exercising. Work-related stress can eat away into not only productivity at work, but also personal and family time. Often, managing work-related stress is largely about managing expectations. Ask yourself is there an easier and faster way for employees to complete more stressful tasks? Or perhaps there is no easier way; in which case you might step in to help. For instance, the workday at Bayt.com doesn’t begin until 9 a.m., so parents can stress less about their daily errands and take their children to school in the morning, and those who need extra sleep can get it. Also, everyone is encouraged to take a full hour for lunch and short breaks throughout the day. 3. 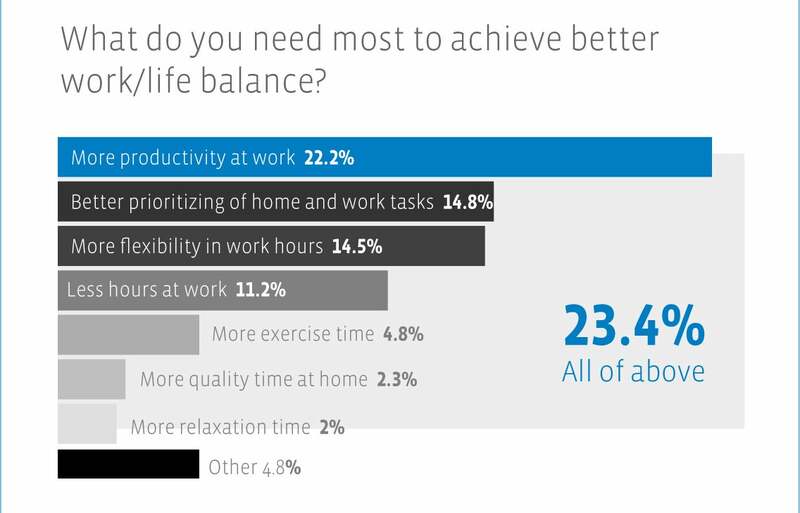 Increased productivity and productivity 22.2% of professionals polled in the February 2012 poll on work-life balance in the MENA believe that greater productivity in the workplace is most needed to achieve a better work-life balance, and vice versa. On the other hand, being creative requires exposure to new ideas and people. If an employee sits at a desk for hours on end, they’re not reading books, having conversations, and engaging in non-work activities that can fuel idea generation. Without a steady stream of fresh thinking, businesses become stale and stagnant. 4. Reduced absenteeism and health costs Employees today are generally more stressed which reduces performance levels. Absenteeism due to family commitments and stress could be a major reason for low performance levels. Work-life balance initiatives improves employee performance by reducing absenteeism, lateness, healthcare and sick-leave, and hence their related costs. It’s a simple fact: people who are free of worry about what is going on at home can be more productive at work. 5. Improved staff morale and engagement A sustainable work-life balance helps employees lead a healthier and more balanced life by allowing them to better concentrate at work, improving the work environment by increasing employee motivation, engagement, and job satisfaction. According to our poll on work-life balance in the MENA, 56.7% of professional respondents agree that they have achieved a good work-life balance. 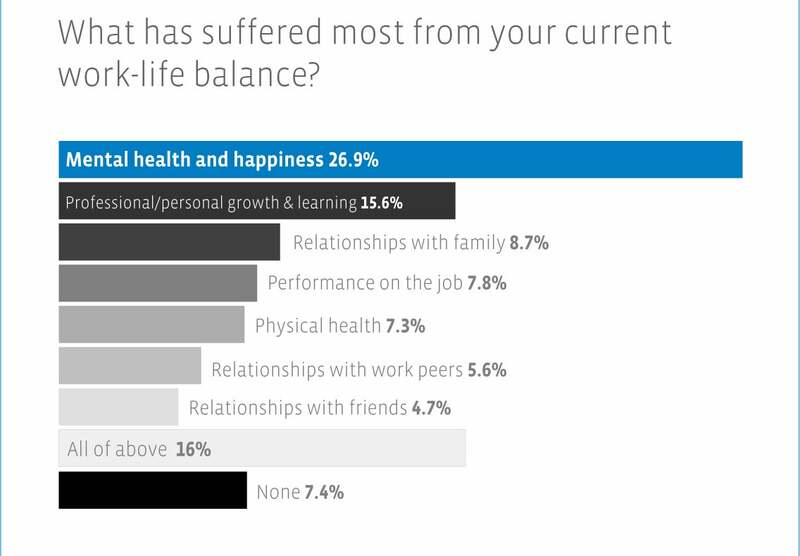 A little more than a quarter of respondents (26.9%) feel the area most affected by a lack in work-life balance is their mental health and happiness. 15.6% say an imbalance hinders professional and personal growth, and for 7.8%, it deters performance on the job. Only 12.8% of professionals polled agree that what they like most about their job is the level of work-life balance achieved. 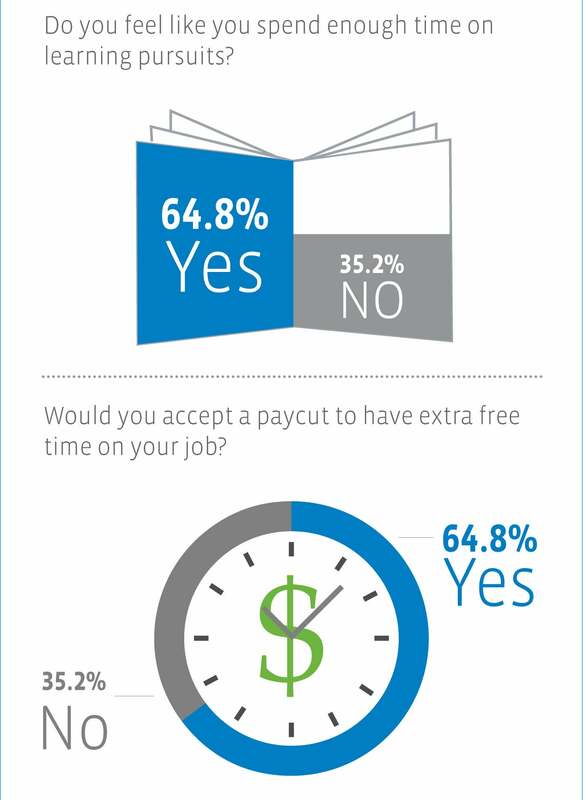 The good news is that nine in 10 professionals feel that work-life balance is very much attainable. A. Set the example Management support for work-life balance is critical, and it must come from the top. Too often, the perception that hard work is the only way to rise in a company keeps employees at the grindstone, working themselves into illness. Top executives can set examples of good work-life balances and make it known that the same is expected from rank-and-file employees. The Bayt.com ‘Work-life Balance in the MENA’ poll shows that 89.3 per cent of professionals in the region believe that balancing work and life is actually possible. B. Use employee surveys Surveys of employees’ work-life issues can help a company understand workers’ needs and design appropriate policies to meet them. C. Set priorities for all work When priorities are unclear, employees tend to overwork because they think that everything must get done at once. Setting priorities allows employees to schedule tasks over a reasonable period of time. 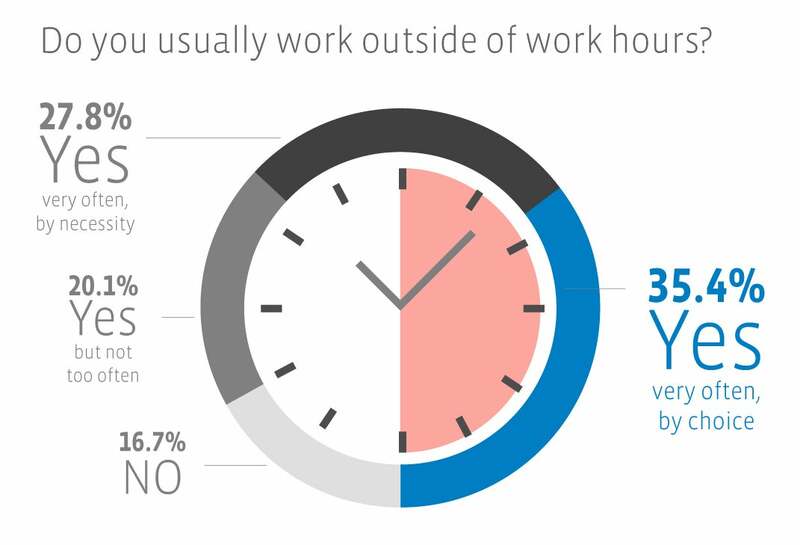 Results from the Work-life Balance in the MENA poll indicate that 35.4% of professionals in the MENA very often end up working outside work hours by choice, while 27.8% professionals admit that they work outside work hours due to necessity. If the overtime is chronic, talk to your team and suggest an alternate solution they would be happy with; if it’s a seasonal or temporary issue, you may want to ensure that their efforts are not going to be in the least bit unnoticed, unappreciated or unrewarded. D. Train line managers to recognize signs of overwork Supervisors can spot increasing error rates, absenteeism and signs of stress-related burnout more easily than anyone else in the organization. Employees who show these signs of a poor work-life balance can be referred to employee-assistance programs. E. Organize seminars on work-life balance Such seminars can help employees understand the importance of a good work-life balance and find ways to achieve it. They teach employees how to better manage their workloads, eliminate unproductive work habits, get sufficient exercise and negotiate more flexible work conditions that meet their needs. F. Use flexible work arrangements Achieving a good work-life balance for your employees could be as simple as altering work arrangements by including flexible hours, part-time, sabbaticals for long-serving personnel, and extended leave periods for new parents. 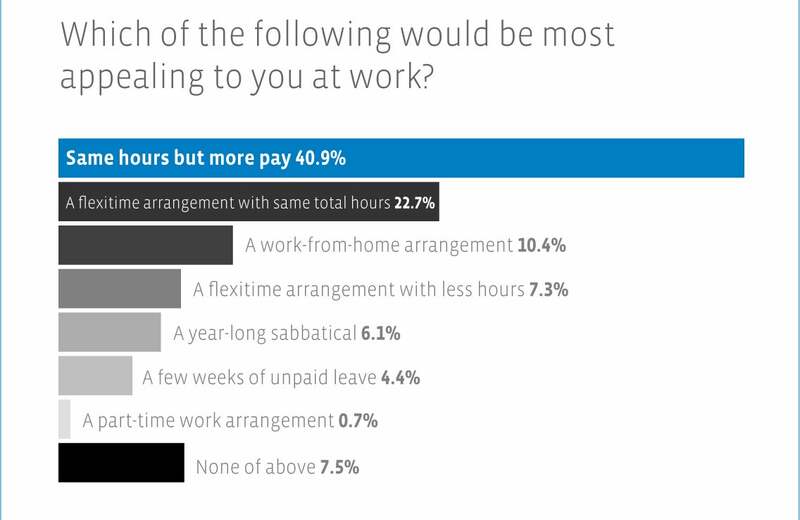 22.7% of respondents in the Work-life Balance in the MENA poll said a flextime arrangement with same total hours would be most appealing to them at work. Companies should identify which jobs lend themselves to flexible work scheduling and implement formal policies for coordinating flexible schedules. G. Promote telecommuting Telecommuting is a way for employees to work from home. It cuts down on stress and unproductive time due to a commute. Telecommuting can be a good option in some cases, and was favored by 10.4% of respondents in the previously cited poll. F. Encourage the use of vacation and sick-leave time Another good practice is to advise employees to use their vacation and sick-leave benefits whenever signs of burnout or illness arise. Sponsoring employees’ family-oriented activities is another way to combine work and life. Sporting events, excursions to amusement parks, fishing trips and other family-oriented jaunts are good opportunities to help employees strike a better work-life balance. Whether it is to spend more time with family and friends or on sports and learning pursuits, a good work-life balance has been repeatedly identified as the top motivating factor at work in the MENA in the Bayt.com survey on employee motivation. G. Adopt a formal leave policy for special cases A formal policy for employees with dependents recognizes and encourages the need to care for sick children or elderly parents. Moreover, some companies allow employees to take leave for community service. These firms recognize that employees obtain life satisfaction from projects or work outside of their regular jobs. H. Limit how often employees take work home The line between work and home lives tends to blur when employees regularly take work home. This practice should be monitored by management personnel, who should also develop plans for making sure that work gets done at the office instead of at home. In light of the above, achieving a good work-life balance could be as simple as altering working arrangements to enable more flexibility. The Bayt.com survey on employee motivation shows that an overwhelming 98% of working professionals in the Middle East consider work-life balance a vital factor which directly affects their motivation levels at work. Across the region, only 18% of professionals said that their employers provide them with all the support they need to achieve a better work-life balance. Companies that encourage a healthy lifestyle and accommodate for different priorities on a year-round basis are more likely to expect improved motivation and loyalty levels among their employees. I. Encourage a healthy lifestyle The Work Satisfaction in the MENA poll shows that 39% of MENA professionals are occasionally affected by job-related stress, and as many as 35% indicate stress at work affects them most of the time. Work-related stress can eat away into not only your productivity at work, but also your personal and family time. Achieving work-life balance begins with managing stress by committing to a healthier lifestyle that includes better time management, better eating habits, regular exercise, and a generous time allocation to activities that make you feel truly satisfied, fulfilled and happy. Achieving work-life balance is not just a one-off exercise, but a long-term commitment to operating your business in a way that respects your employees’ responsibilities outside work. Policies designed to help you achieve this need to be tailored to your business and your employees. In fact, drawing up an organization-wide policy on flexible working and other work-life balancing measures can have a positive impact on management by underlining the circumstances in which a request for flexible working will be considered and approved. This saves management time, and means that inconsistencies in management decisions are removed. It also helps employees by explaining their rights.